Khadim understands that the fast-paced city life, busy schedules, and long commutes often leave you with little time to actually pursue your passion. Relax, we at Khadim. Online have a strong network of curated agents who provide services right at your doorstep. Khadim is your locally owned, expert home contracting team. We work with our customers throughout the entire process of turning their ideas and dreams into a finished product. Paying attention to detail is extremely important to us. Quality workmanship and customer support from the beginning to the end of all projects are an essential part of our business philosophy. 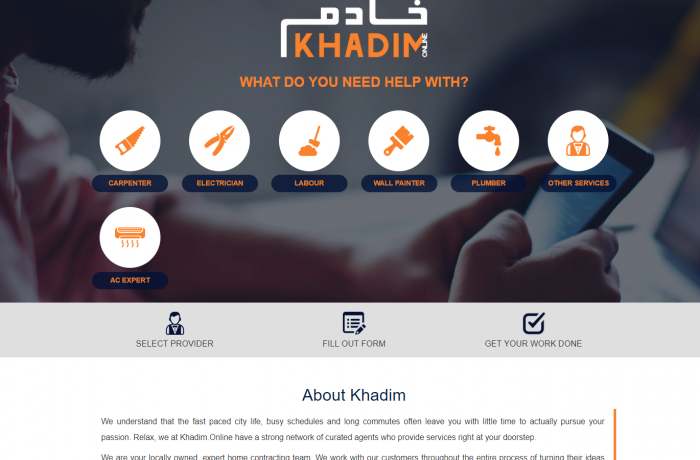 Khadim know how overwhelming home renovations can be, and worrying about trusting your contractor should be the last thing on your mind. We are proud to provide hard, honest work at fair prices. We want your remodeling experience to be a pleasant one, and our team is more than happy to assist you with everything, from product selection to room design. we are here for you! Whether you have a remodeling or maintenance project, we can get it done!